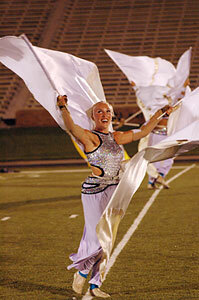 Perhaps the most instantly identifiable visual "trademark" among 2007's DCI World Championship Division I corps was the prevalence of the Blue Devils "wings." These huge props filled up the field with a cloak of darkness at the beginning of the corps' show and brightened the confines of the stadium at the end with masses of white. The origin of the wings dates back to 1982, after the corps' guard had gotten rid of their shako hats and English riding boots, which in turn opened up greater possibilities for dance. The guard designer/instructor then, Shirley Dorritie, was looking for ways that fabric could be connected from the ankle to, as she describes, "as high as we could reach." Dorritie was with the corps from 1968 through 1984. "My goal was to find an impact that was different from just using rifles and flags, in addition to having something that would allow the guard to play around with a lot of color," said Dorritie about her winged creation. 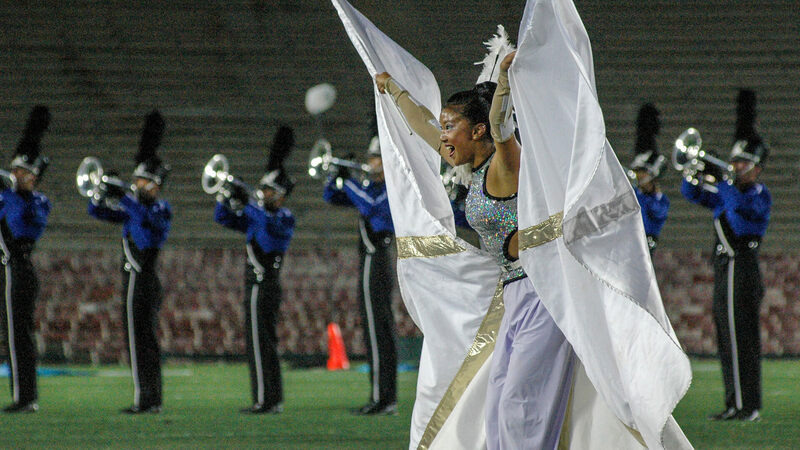 Almost instantly, the wings generated a lot of discussion through the drum corps community. According to Dorritie: "When we look at the wings now, we don't see quite the same contrast we had in the '80s. Before 1982, people had been using flags that matched their uniforms and we didn't see a lot of variation of color. What the wings gave us was an opportunity to use color in and of itself." Dorritie says the Blue Devils guard used just 12 sets of wings in 1982. The next year, they brought out 32 sets colored hot pink. In planning this year's "Winged Victory" show, current corps guard designer Scott Chandler called Dorritie to ask what inspired her to conceive the first wings. When she told him that her goal was to put vast amounts of color out on the field, he responded, "Oh, I get it. It was about something very different than what had come before." His focus for the 2007 visual concept was to use the wings to create massed darkness and then light. "The creation of the wings we used in the '80s was a serendipitous thing," said Dorritie. And now, more than two decades later, a whole new generation of corps fans got a chance to enjoy the reincarnation of her creation, an event that transpired before any of today's marchers were even born.